Ran in the Provo Canyon in the morning. Measured wind strength by running a 1:28 quarter uphill during the warmup. Then ran the 3 mile tempo from Nunns Park to the mouth of the canyon with an aggressive marathon pace effort. First mile 5:37 (asleep), then woke up and ran two 5:23 miles - total time 16:23. Still felt lazy, but 5:23 pace felt very good, although it did require some concentration. Then jogged back to the Canyon Glen Park, and did 5x400 with 200 rest downhill. 69.6 - 70.3 - 70.5 - 70.0 - 69.2 (last 100 16.6). Felt lazy. Watched my splits like a hawk, and only sped up if it looked like it was going to be over 70. It seemed like there was some barrier at around 71 second pace that made me feel so comfortable when running slower that I had to push myself to cross it. Sarah went into labor in the afternoon, and for a while we thought the baby was coming. However, her contractions stopped after 6 hours. Good for us - we got good sleep. Hopefully, we can get them going again this afternoon (Tuesday) and get the baby out. Ran with the kids in the evening. Total of 12 miles for the day. Starting to taper for Draper Days/Desnews marathon combo. Ran with Danny Moody in the morning. We spoke Russian all the time. Did a tempo mile with net uphill near my house in 5:38. However, on the flat the pace was 5:30. Did sprints with ankle weights - 4x100 ? - 17.3 - 17.6 - 17.7 - did not want to go fast, but seeing Danny ahead of me got me going. Then ran with the kids - Danny and Steve Hillam joined us. Bench press in the afternoon (narrow grip) - two sets of three with 95, then a set of two ( could not do third). Easy run with Danny and Steve. Did a tempo mile in 5:37 this time without the uphill. Did 4x100 with ankle weights in around 18-19 seconds. Ran with the kids. Went a on a walk with Sarah trying to get the baby out. Then in the afternoon took a walk with Sarah in the Provo Canyon. She ran 100 meters in 35.2 - the fastest I've ever seen a pregnant woman dilated to a 6 go. She really impressed me. But still that did not put her into active labor like we hoped. Ran with Steve Hillam in the morning. Major taper for the marathon/Draper Days. Ran 0.5 in 2:30.6 to practice 5 K race pace. Then ran with the kids. Benjamin set a record on 0.5 - 3:26.6. What impressed me was his furious kick - last 200 in 47, and last 100 in 22. Jogged 0.5 in the evening with Joseph in the stroller. No baby yet. Sarah woke up shortly before 2:00 am, and had strong contractions. We called the midwife, shipped the kids off to a neighbor's house, and got ready for the baby. Jacob Alexander Pachev was born at 3:56 am at our house, weighing 9 pounds and 5 ounces, and 21 inches in height. We believe it is a record in weight for the 22 grandchildren of Sarah's parents. It is also the first time she went into labor in the middle of the night. And she ran a record 100 meter sprint within 36 hours of delivery while trying to go into labor - 35.2. She very impressed me when she said "I love you" in the middle of a hard contraction. She has never said anything unfriendly before during labor in the past, but I do not remember ever hearing "I love you" in the middle of a contraction. Having children definitely has had a refining influence on her. Interestingly enough, the pushing stage lasted about 16 minutes - about the time it takes me to run a 5 K, which is something I get to do tomorrow. I consider the 5 K to be the most painful race when I am in shape. After things had settled down, I put up "It's a boy" sign that has already been prepared, finished my scripture study (interestingly enough, read the last 2 chapters of Jacob in the Book of Mormon), and got ready for my run. Still tapering, so only 4 miles + the kids run. Ran with Steve Hillam and Danny Moody. We did a 0.5 in 2:27.3. Danny helped with the pace quite a bit, and I really appreciated it, because otherwise I would have been falling asleep. Still, this is nothing compared to the sleepiness on the last leg of the Wasatch Back Relay. Then later in the morning took a nap, and then ran with the kids. Our neighbor Abby joined us, and did pretty well - we went her pace, and ran the mile in 9:33. Draper Days 5 K, 16:00, 6th place. 23:52, new PR by 1:13, and 96th overall, 4th in 11 and under for Benjamin. Got up at 5:00 am, took Benjamin with me, and we went to run the Draper Days 5 K. It was hot - about 80 degrees at the start. I felt lazy during the warmup, and did not even feel like striding very much. Saw Joe Wilson and Dennis Simonaitis in the warmup, and developed a race plan - hang in with them for as long as I can. We hit the first mile (downhill) in 4:45. Joe Bendoski was ahead by about 10 seconds or so, we had Leon Gallegos and Danny Moody with us, and a thick pack within 5 second behind us. When I saw the split, I knew today would not be a run for time. 4:45 sounds fast, but it is slow for that particular mile. I ran it in 4:33 when I set my PR of 15:37, and I was right there with my competition, not way ahead. That is just the way this course goes: 2% grade down on the first mile, then you gradually roll up for the rest of the race to average a 0.4% drop. Joe and Dennis kept pushing the pace. I managed to make it to 7:00 into the race, and then I had to let go. I could stay with them fine on the downhill, but as soon as it flattened out it did not take them long to do me in. However, they pulled me a way a bit from a pack of wild beasts, and I really could use that safety buffer. 10:05 (5:20) at mile two. Not bad for the uphill. 9:38 for Joe Bendoski, 9:50 for Dennis and the other Joe. Way too many fast Joes in this race! At the turn after mile 2 (11:37 into the race), still 4th. However, with Neal Gassman and Tim Stringfellow behind me, this is not a safe position. I made a decision to hang in there with however catches me for as long as I can. At 13:10 into the race Neal finally catches me. I was able to shift gears and go with him. Set a goal for myself to make it to at least 14:00. Made it to 14:05. Now hopefully that would discourage the pursuers. Neal is exceptionally strong on the last mile. Pretty much the only way he can be beaten is if you never see him. So running with him for a minute pulls you away enough to discourage most of the pursuers. Most but not Tim Stringfellow. Being very well aware of that, I try my best to do some semblance of a kick. Too hot, and I am feeling just plain lazy. Almost made it. Tim sprinted past me with a few yards to go. That booted me out of money, but I still got a decent time - 16:00. Joe Bendoski won with 15:10, then Dennis 15:22, Joe Wilson 15:33, Neal 15:49, and Tim 15:59. 16:36 after the start of the race having finished all the tear-off tag stuff I am headed back to find Benjamin. Met him at 20:37. He ran strong, and finished in 23:52, which is a huge PR. He finally earned his USB cameray. I am very excited for him. Too bad he still has to race 11 year olds, and we have some fast ones around here. This got him 4th in his age division, and booted him out of the awards. So both of us today ran a good time, but got booted out of something. Did bench press in the evening - 3 sets of 3 with 95 pounds (narrow grip). That felt better than Thursday. Also ran with Jenny and Julia. Benjamin joined us. 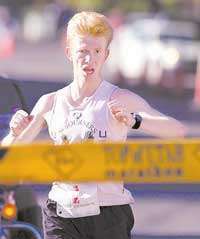 Deseret News Marathon on Monday.